The original toll from crossing the bridge was one penny. When it opened, it was the longest suspension bridge in the world, the first steel-wire suspension bridge, and the first bridge to connect to Long Island. Con man William McCloundy was sentenced to 2Â½ years at Sing Sing Prison for selling the Brooklyn Bridge to a tourist in 1901. The bedrock on the Manhattan side of the bridge turned out to be much deeper than expected, so the tower on that end of the bridge rests on sand rather than rock. About 78,000 vehicles cross the nearby Manhattan Bridge every weekday, while an average of 144,000 vehicles cross the Brooklyn Bridge every weekday. The Brooklyn Bridge is one of the most famous landmarks of the New York skyline. Connecting Manhattan and Brooklyn, this feat of engineering is one of the oldest suspension bridges in the United States and has been named a National Historic Landmark. At the time that it was built, the Brooklyn Bridge was the longest suspension bridge and the first steel-wire suspension bridge in the world. Begun in 1870 by German immigrant John Augustus Roebling, the Brooklyn Bridge was completed thirteen years later by John Augustus’ son, Washington Roebling, after his father died from complications involving a crushed foot. Washington Roebling also suffered from his time spent supervising the work on the bridge. Decompression sickness from working in the bridge’s pressurized caissons under the river ultimately ruined Washington Roebling’s health, and required Roebling’s wife, Emily Warren Roebling, to assist him extensively with directing the work. Emily Warren Roebling was the first person to cross the bridge after it was finished. 150,000 people attended the celebratory inauguration of the bridge on May 24, 1883, all of them impressed by the network of steel cables and strong pillars that supported the structure. However, some New Yorkers were not entirely convinced that the bridge was safe. On May 17, 1884, in one of the most famous episodes of the Brooklyn Bridge’s history, P.T. Barnum led a troupe of 21 elephants across the bridge to silence the naysayers and prove the bridge’s integrity. The Brooklyn Bridge’s most distinctive features are the 276-foot tall masonry towers that hold up the suspension bridge. The neo-Gothic arches in each of the towers make the Brooklyn Bridge one of the most beautiful and monumental sights in New York. Built of granite, limestone, and Rosendale cement, the towers are easily the most recognizable feature of the bridge, which has become a landmark example of New York’s classical architecture. The towers of the Brooklyn Bridge share their classic elegance with Grand Central Station, a prime example of early twentieth-century innovation and architecture. 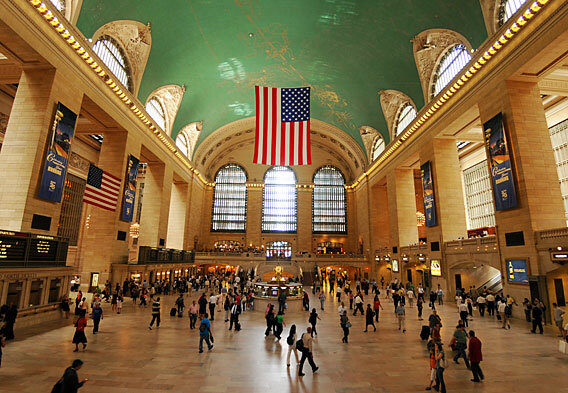 Like the Brooklyn Bridge, Grand Central Station is a National Historic Landmark and its construction was a project that combined extensive city planning with exceptional design talent. At the Brooklyn Bridge there is a pedestrian walkway on a level above the lanes of vehicular traffic. This allows people to enjoy the view of Manhattan, Brooklyn, and the East River from the Brooklyn Bridge, without traffic whizzing by. There is no toll to either walk or drive across the bridge, and crossing it is one of the best things to do in New York. Along with the lovely views of the city from the bridge, there are many places in Manhattan and beyond to enjoy the opposite. 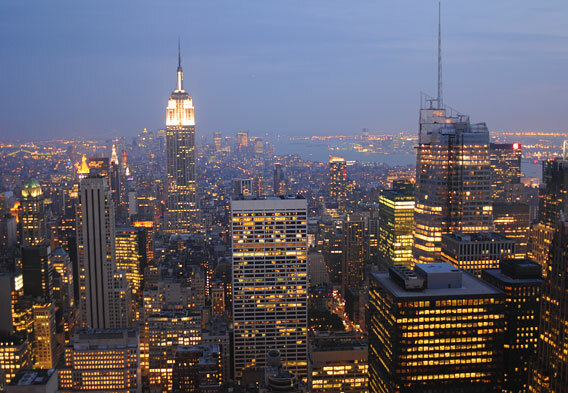 From the Top of the Rock, the viewing platform at the apex of the Rockefeller Center, you can get a great view of the entire length of the Brooklyn Bridge from above, as well as a 360-degree view of New York City. It’s one of the best vantage points to take photographs of Manhattan. Another great place to view the Brooklyn Bridge is from the Brooklyn Bridge Park, an urban park that offers several acres of lawn and green space, as well as a riverfront promenade. The park is in Brooklyn Heights, across the river from Manhattan. The Brooklyn Bridge is just one of the great sights to see in New York. It is attractively lit up in the evening and is a favorite with photographers and artists—much like Times Square at night, which has also become an immediately recognizable image of the city. Viewing Times Square and the Brooklyn Bridge in the evening gives you that iconic view of Manhattan’s bright skyline, a definite must-see for visitors. It is also a fascinating juxtaposition of the old and new—the classic lines of the Brooklyn Bridge, and the neon-lit, frenetic crowds of Times Square. If you’re looking for the best things to do during a trip to New York, try walking across the bridge from Brooklyn to Manhattan. 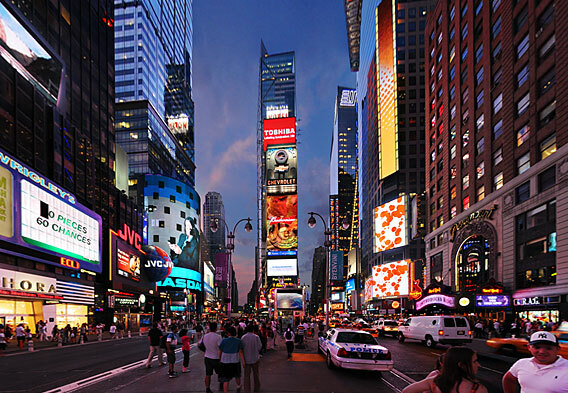 Then, take the opportunity to visit the best Manhattan sights such as Central Park, the Museum of Natural History, the Metropolitan Museum of Art, and Times Square.